The iconic Fox is taking players on another adventure! After last year’s merger between Scientific Games (SG) and NYX, everyone thought that NextGen’s iconic Foxin’, would never come back to the screen. But hope is not lost it seems since SG announced they’re reviving the hero in May 2019. There’s no doubt in everyone’s mind. When naming a hit game by the NYX & NextGen group, the Foxin’ series often makes the top of the list. 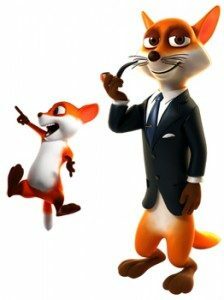 In fact, Foxin’ himself is a solid brand in the UK. Many casinos like Vera&John and Spin Station promote the series. And let’s not forget to mention that social media is booming with winner stories on Foxin’, Foxin’ wins again, and Foxin’ Football Forever. And surely, because of that, the next adventure of Foxin’ Twins will make a few curious. Well, at least that’s what SG is hoping for. At the moment SG is keeping a lot of details secret. Perhaps to build up anticipation. But here’s what we know so far. The new game will offer a dual reel set. So the overall game interface has 10 reels, 3 rows and 50 paylines. The new game will have a variable RTP of 95.2% and up to 96.75%. And finally, the max win of the new Foxin’ Twins could see players pocket up to 10,000x their original stake. Sequel games a new trend? It seems as though SG’s strategy for 2019 too, is to revamp classic slots. Perhaps this was heavily driven by the recent nomination of MONOPOLY Millionaire for “Top Performing Games” in the EKG Slot Awards. But let’s not forget to mention that, the exceptional performance of Medusa 3 across Britain, may have driven this decision too. Revamping classics seems to be a trend of the industry nowadays. After all, NetEnt recently launched Dead or Alive 2. And Microgaming has also released a sequel to Agent Jane Blond. It kind of makes you wonder, what’s next for 2019?